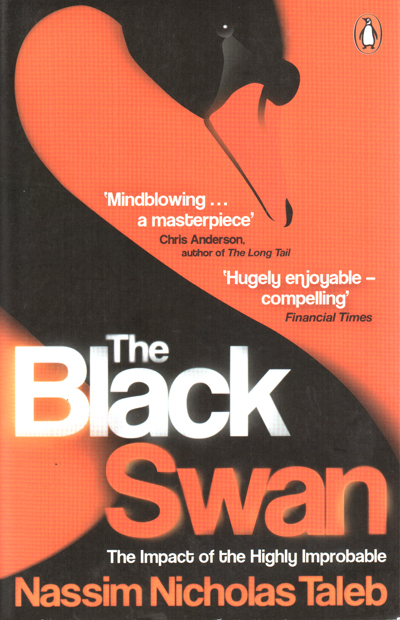 I recently finished reading ‘The Black Swan: The Impact of the Highly Improbable’ by Nassim Nicholas Taleb, the Lebanese essayist, writer, philosopher. I had read his ‘Fooled by Randomness’ a few years back, and the essential message of this book is, more or less, similar. The basic premise of both the books is this: The past is always only clear in hindsight, and it is not a good predictor of the future. The additional elaboration in this book (and a lot of it!) is that not only is the past random, but the future is not predictable based on the past simply because, most of the times, the future happens due to a ‘Black Swan’ event that nobody can predict in advance, but ends up shaping the future. While this is the core concept, the book is relentless in providing multiple examples through history, culture and markets to prove the point. While the book is not in the same category as some of the legendary ‘Guru Books’, it is still reasonably decent reading with some good takeaways once you get this basic point of the futility of predicting the future. It tends to get a bit self obsessed at times, and keeps on rambling in a sense – often forcing the reader to, kind of, turn to the next page after getting the point. One of the disappointments of the book is that eventually it ends without any clear thoughts on how to handle ‘black swan’ events, except saying that ‘get it into your mindset and prepare for it’. Now, whether one agrees or not with the basic proposition based on which this book is written, it contains a number of nice quotes that make you stop and wonder whether it is humor or wisdom or both. So if one can have the patience to finish the book, it does contain a number of such snippets which provide for entertaining reading. 1. ‘Black swans’ are highly consequential but unlikely events that are easily explainable – but only in retrospect. Black swans have shaped the history of technology, science, business and culture. As the world gets more connected, black swans are becoming more consequential. 2. When you develop your opinions on the basis of weak evidence, you will have difficulty interpreting subsequent information that contradicts these opinions, even if this new information is obviously more accurate. 3. If you hear a “prominent” economist using the word ‘equilibrium,’ or ‘normal distribution,’ do not argue with him; just ignore him, or try to put a rat down his shirt. 4. In developing treatment theories, doctors most commonly get mixed up between absence of evidence and evidence of absence. So do statisticians. 5. The inability to predict outliers implies the inability to predict the course of history. 6. If the past, by bringing surprises, did not resemble the past previous to it (what I call the past’s past), then why should our future resemble our current past? 7. Things always become obvious after the fact. 8. Missing a train is only painful if you run after it! Likewise, not matching the idea of success others expect from you is only painful if that’s what you are seeking. 9. Cumulative errors depend largely on the big surprises, the big opportunities. Not only do economic, financial, and political predictors miss them, but they are quite ashamed to say anything outlandish to their clients — and yet events, it turns out, are almost always outlandish. 10. The same past data can confirm a theory and its exact opposite! If you survive until tomorrow, it could mean that either a) you are more likely to be immortal or b) that you are closer to death. And finally, the book ends with this.